DG Servicing offers all types of door repair & locksmith services for your home or business. 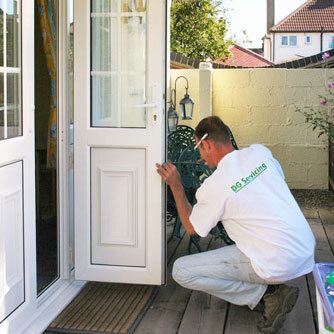 Whether you have a front door, back door or patio door in need of repair, our team of expert fitters are able to carry out repairs with the minimum of disruption. If you're looking for a professional company to fix your lock such, mend your door frame or even fix a faulty cat flap, DG Servicing can help you. My patio door does not slide properly. Probably the rollers have worn out, and possibly the track may also need replacing. This can be confirmed by a site visit. My front door is difficult to close. The likelihood is that the door has dropped. We can toe and heel your door and adjust keeps if necessary. Note: if your UPVC door won't lock, the changes in weather can cause the materials to expand and contract. I've been burgled and want to change my front door keys. We would simply fit a new cylinder which comes with 2 keys or change the mortise lock. A large part of my cill is damaged, would a new cill need to be fitted? We can repair any UPVC damage, scratches, holes or burns.